Mother’s Day holds a special place in the hearts of the IDC owners and accordingly, they challenged us to develop a TV commercial that celebrated the essence of motherhood in lieu of the typical merchandising spots that were standard fare from the competition. This is the result and we are very happy to report that the response received from customers and many other industry sources was overwhelmingly positive. The client also appreciated the very low cost of production. After running “Testimonial” TV spots for the better part of two years, Bascom’s management asked us to develop a new commercial that focused more on the many accolades they had recently received from the press. Secondarily, they wanted to emphasize lunch, plus weekend and private dining. Our solution achieved “all of the above” and quickly increased traffic across the board. Having Jacksonville’s first and only HVAC Showroom with fully functional equipment, Snyder Air Conditioning needed a dramatic way to introduce it to the public. So we created a radio campaign that creatively demonstrated the advantages of “test driving” a home comfort system prior to purchase. Response was phenomenal and the spots significantly helped the sales staff to close more deals. As a new entry into the already crowded steakhouse market, Durango management needed a breakthrough creative platform to highlight its primary advantage over competition: grilling over real oak wood. Our answer was to craft an award winning jingle that emphasized the chain’s Southwest influence with a dramatic flair, plus easily recognizable tune and refrain. The results were “smoking” to say the least and led to dramatic increases in traffic and sales. The company manufactured and marketed a superior brand of Electronic Article Surveillance (EAS) Systems to help reduce shoplifting losses for retailers worldwide. 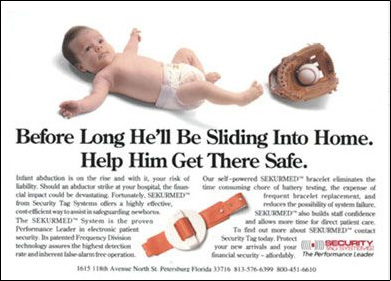 As it turned out, the same technology was also uniquely suited for preventing infant abductions in hospital nurseries, a major liability concern for those institutions. 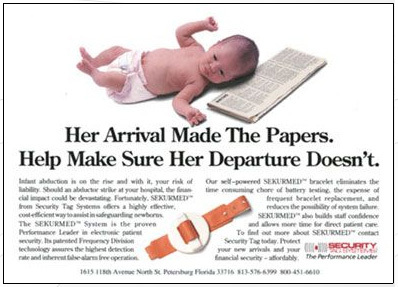 To introduce the concept to hospital administrators and security personnel, we designed a series of award-winning print ads that ran in several top trade magazines around the country. Not only did this ½ Page Campaign win “Best of the Bay” honors at the local Addy Awards, it won Silver at the Regional Addy Awards and outscored many bigger, more expensive full page ads in readership studies.